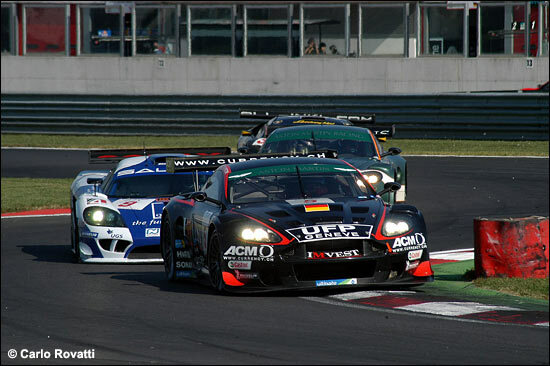 Jean-Denis Deletraz (left) and Andrea Piccini went into the penultimate race of the FIA GT Championship, at Adria on Sunday (October 15) with a fighting chance of challenging the #1 Maserati drivers, and Bert in the Saleen, for the title – and the Swiss was understandably furious at what transpired on lap 16, barely 20 minutes into the three hour race. “It was really close and fair between the three championship cars (his Phoenix Aston Martin with Andrea Piccini at the wheel, the Zakspeed Saleen and the #1 Maserati – with Christophe Bouchut involved too.. plus Fabio Babini) – but Babini was 20 metres behind Andrea, when I am sure he lost his braking point. “He claimed that Andrea braked early, but that is ridiculous. You saw it on the TV? He smashed our car off the track. 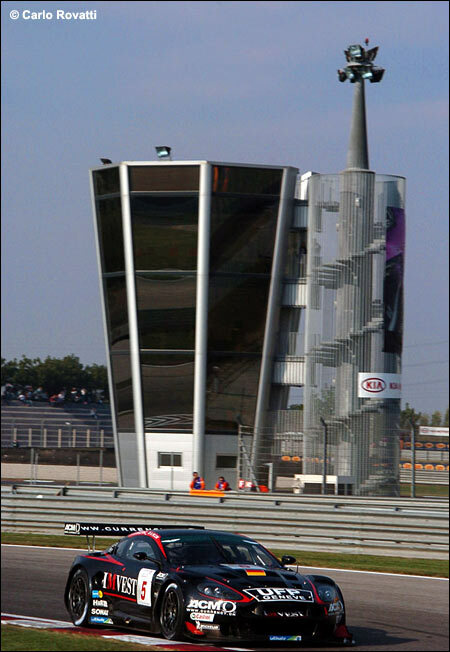 So from potentially going for a championship, Deletraz and Piccini were reduced to bystanders – although the Phoenix Aston Martin did briefly resume racing five laps down after repairs, although it was soon retired with terminal brake problems. 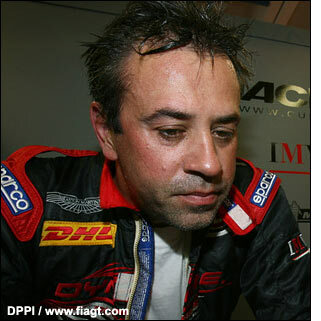 Jean-Denis Deletraz was more than a little surprised to find that the FIA stewards considered that the contact from Babini was a racing accident. Deletraz made his feelings known to Stephane Ratel, who pointed out that he (Ratel) is in the hands of the FIA officials: it is their job to judge any incidents and penalise any offenders. “No one wants the responsibility,” said a highly aggrieved Deletraz today. “It’s really bad for the sport when there is contact like this but no penalties. We have had several incidents like this during the season. But we never have penalties. In F1, the drivers immediately get penalties. Here's Piccini leading Janis, Babini and Bouchut - and below that, the Italian's brief charge through the leaders (Gollin behind #5), after a five lap repair, but before an imminent retirement. With 65 FIA GT races to his name, and four overall victories, Jean-Denis Deletraz is suitably qualified to comment on where the FIA GT Championship has got to in 2006 – and where it is going. “The problem is that every team would like something different for 2007 – short races, long races, in Europe, outside Europe, with the DTM, not with the DTM. I don’t know how Stephane is going to manage this problem. So what are you considering for next year? “First of all, we will decide about the last race at Dubai. We will decide whether to go or not very soon. It’s very expensive, and we would be going just to race there – maybe against a small number of GT1 cars, with the championship over. We should have been going there to decide the championship. “Peugeot’s decision to support the Le Mans Series is very significant. They are helping to build the support package with their small cars, and they will be spending a lot of money on the TV and the media exposure. Peugeot has a lot of power, and that makes the Le Mans Series really strong. It’s very bad for the FIA GT Championship. “But I want to do more than five races in a year! Le Mans is like two races – with the test day and then race week – so that makes seven. My ideal would be nine, so Sebring, five races in Europe, Le Mans and Petit Le Mans at the end – that would be my perfect season. 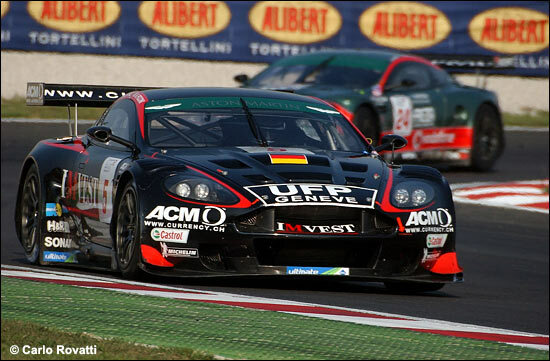 The FIA GT calendar was expected by the end of this month, so perhaps then we will see where the Championship is heading for 2007.